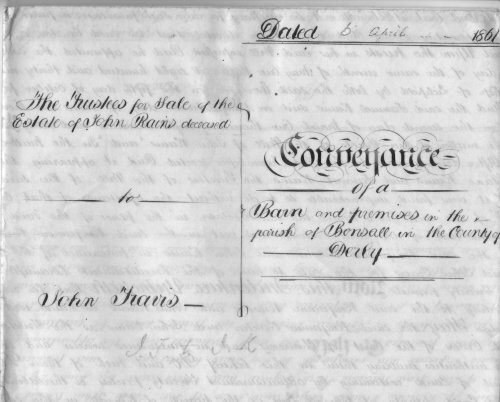 Here is an interesting Indenture obtained on Ebay dated 1861 about the Conveyance of a Barn and land in Bonsall from John RAINS (deceased) to John TRAVIS. "Indenture: A writing containing a contract, so called from the two copies being originally indented, so as to correspond with each other." Indenture documents were cut by hand in an irregular line, so that in order prove they were legitimate they had to fit together perfectly. Champion Farm is 1 mile West of Duffield and 1 mile South of Windley in Derbyshire. CONVEYANCE of a BARN and premises in the parish of BONSALL in the county of Derby. Received on the day and year first within written of and from the within named John TRAVIS the sum of Twenty pounds being the consideration money within mentioned to be paid by him to us. 1849      |     1867       1853      |     1853 >1881      |     1885? There are 3 examples of John RAINS' abode in the document. To the modern eye, this placename is easily read as Ironbrook. In 1535 the placename is found as Irnebruke and in 1546 as Irenbroke. The Wirksworth Parish Registers show 67 examples of Iron- and none of Ivon-, although many of these are indeterminate and it was decided that Iron- was intended. Examples of a definite letter "v" in this 1861 Conveyance show it never had a pothook to begin. However Modern maps always show Ivon-, and it is believed this is how natives pronounce their home. It is left to the reader to decide how the home of John RAINS, Testator of the Will referred to above, was pronounced in 1861.
thanks for putting my stuff on your page. I haven't had chance to put together much more about the farms in the area just yet, got a bit sidetracked with the Buxtons mentioned in the document. I found Benjamin Buxton's family in your transcription of Ince's pedigrees page 061b. According to this, Benjamin Stone Buxton was the son of Walter Buxton who in turn was a son of George Buxton of Brassington. George was a son of Walter Buxton a farmer of Castern, Staffordshire. Probate for Benjamin Stone Buxton's will was 1865, so he must have died between 1861 census and 1865. I've just searched Free BMD and his death was registered in the march quarter 1865, Bakewell registration district 7b 441 I haven't been able to find anything more about these Buxtons yet. I haven't found John Travis after 1881 when he is living with wife Ann daughter Ann and grandson Thomas in Turnditch. The residence is Common Side, but there is a note under this saying Transferred to Hulland Ward. There is a death registered in Belper RD march q 1885 for a 70 year old John Travis which could be him. Can't find John junior in 1901, but his wife Mary A Travis is living in King st Belper with her nephew. She is listed as a widow. Not quite sure when John died, the only one I can find in free BMD is John Travis age 58 died 1899 dec quarter registerd in Uttoxeter reg dist. He is age 42 born Withington Lancashire and is a victualler. He has a wife, Anne age 41 born Pilkington Lancashire and a daughter Elizabeth age 6 born Bonsall. I am still a bit puzzled as to where this stamp and annotation fit into things as you state that the document is dated 6 April 1861, several months later. I have just noticed an error in the email I sent you earlier where I have listed Mary Wood as dying in 1852 and being buried in Nov 1853. The death year should have been 1853 not 1852. Regarding your query over the spelling of Ivon/Ironbrook. I'm going with Ivonbrook as it appears to be the modern version and is also the spelling on ordnance survey maps from the 1800s. Early versions of the name are something like Wen's brook or Wenbroc from things I've seen, so my feeling is that the v is closer to this. However, I have seen plenty of instance of Ironbrook. I saw the document on your website yesterday and was intending writing to you as I have information on all of those mentioned in it. Before I start, I must thank you for your excellent site, which was one of the first that I found on the internet when I started investigating my family tree a few years ago. (Dawn's site was the other one). After finding hundreds of ancestors from my Rains branch on these two sites, I decided that it would be a fairly easy thing to trace my family. Little did I realise at the time that I was very lucky that my Rains lived half way between Winster and Wirksworth and that your two sites were by far the most comprehensive of any places in England. Since then I've used your PR transcriptions, census material and Dawn's research to put together a sizeable tree. I've passed on everything I've found to Dawn and most of this has been incorporated into her site, but I can fill in more details. First a bit of my background. I live in Australia, having emigrated from Manchester when I was 4 years old. My father is a descendent of the Rains of Winster/Ivonbrook. My Rains appear to have lived in Ivonbrook at Wiggleymeadow farm/Upper House Ivonbrook since at least the 1600s. The earliest we have managed to link in is Henry Rains who died in 1667 and was buried at Wirksworth 4 Nov 1667. One of their sons was the John Rains of your document. John was born 1774, died 12 May 1839. He married Elizabeth North on 24 feb 1800 St Margaret's church Carsington. Elizabeth was born 1783 Ashleyhay, Baptised 22 Jan 1783 Wirksworth. She died 2 Mar 1860 according to your document. She was buried 6 March 1860 Middleton by Wirksworth. Samuel (1804 - ?) I'm presuming he died before 1841 or left the area as I've not found him in any census or marriage or death after this date. This Ann married John Travis 13 March 1839 Wirksworth. John was born 2 nov 1815 in Ible, baptised 10 dec 1815 Wirksworth. He was the son of Thomas Travis and Hannah Unknown. This is presumably the John Travis mentioned in the document. You have him and his family in the 1861 census at Brailsford Hulland Ward. Your ref Hw40a to Hw40f. Isaac Rains and Elizabeth Cobb had another son called Samuel (1802 - 1852) who is presumably the Samuel mentioned in your document. This would make the Isaac and Samuel of your document nephews of John Rains. This Samuel was my 3rd great grandfather. He married Mary Wood 13 sept 1837 in All Saints Bakewell. Mary was born 1816 in Snelston, baptised 14 April 1816, Snelston, died 1852 Ivonbrook Grange, buried 10 Nov 1853 Middleton by Wirksworth. Benjamin Buxton was born 1826 Aldwark, bapt 28 june 1826 Bradbourne. Benjamin and Dorothy are living at "The Lead Gate" Aldwark in 1851 census together with Benjamin's father, Benjamin Stone Buxton, widower. Benjamin Stone Buxton was born 1788 Aldwark. Both Benjamins are still at "The Lead Gate" in 1861, so I'm not sure which one is the one who signed the document. If I've interpretted the document correctly, there are two John Rains mentioned. The one who died in 1839 and the other one who affixed his seal in 1861 and, along with Benjamin Buxton, was appointed a new trustee following the deaths of Isaac and Samuel Rains. The document says he was a farmer from Ivonbrook and the above are the only two living there. My guess is that the second John Rains was John Wood Rains who took over the responsiblities from his father Samuel, but as he was only 20 at the time I don't know if he was too young to legally be able to do this. The only one I can't connect is William Heathcote. I have found him in Winster in 1861 (and earlier). In 1861 he is living with his wife Mary (born at Alfreton), their son Joseph and a servant Martha Buxton. I don't know if Martha is connected to Benjamin Buxton. They are also living next door to a William Rains age 41 blacksmith and local methodist preacher, his wife Sarah, age 52 and their niece Anne age 6. This William is the son of Ralph and Phoebe Rains, who are from another line of Rains, tracing back to a Robert Rains of Darley. At this stage we don't know of any link to the Henry Rains line. That probably outlines the main connections between them. I have about 400 Rains in my tree so can supply more information if you want. At present I am trying to sort out what was happening on the farms at Ivonbrook. Henry Rains seems to have been the first mentioned in the area, and my guess is that he farmed at what is now upper house/Wiggleymeadow, possibly as one farm. At some stage the farm appears to have been split with what was originally Wiggleymeadow passing down the line mentioned above and what was Upper house passing down a long line of Josiah Rains, starting with a son of William Rains and Mary Marshal. To further complicate matters, the names of the two farms (Wiggleymeadow and Upper house) swapped over in the 1930s when both farms were sold. Wiggleymeadow is now the name of the farm on the East side of the road, but before this it was the name of the farm on the West side of the road. Rains have also lived at Griffe Grange. The Griffe Grange branch descend from another John Rains and his wife Hannah Woodas who appear to have moved there from Ivonbrook in about 1818-1819. This John was another son of Isaac Rains and Elizabeth Cobb. John and Hannah had a daughter Ann Rains b 6 oct 1825 Griffe Grange. She married William Travis, a brother of John Travis on 28 Jan 1858, Wirksworth. In 1871 there are some Rains living at Tophill farm. Their descendents appear to have been living there until quite recently. Before 1871 the farm was occupied by John and Mary Webster and their family. Mary Webster (nee Rains) was a daughter of John Rains and Elizabeth North. I am sorting through some will transcripts that Dawn sent me, which has helped get some of it into place, but there is a long way to go and information keeps coming in faster than I can process it! When I started trying to sort out the farms I did so with the intention of sending my findings to you for inclusion on your site. I will still do this, it is just taking me longer than I thought! I have also been following your discussions of the name Ivonbrook/Ironbrook etc over the last few years. Like you, I have assumed that Imbrook, Embrook, Ambrook and Ivonbrook/Ironbrook are all the same place. The Rains living in these farms are also listed as coming from Grange and Grangemill. The township of Grangemill now has a farm called Ivonbrook Grange Farm and another building called Ivonbrook cottage. However the farms that the Rains lived in (at least in the 1800s) are a little further north of Grangemill township (at Wiggleymeadow) and to the east (Tophill). The farms in the township of Grangemill appear to have been inhabited by other families. To further complicate matters, some of the early parish records mention Ember, Imber and Amber. I'm not sure if they are the same place as Ivonbrook as there was an Ember farm in Bonsall in the ordnance survey maps of the mid 1800s and these may be referring to this. 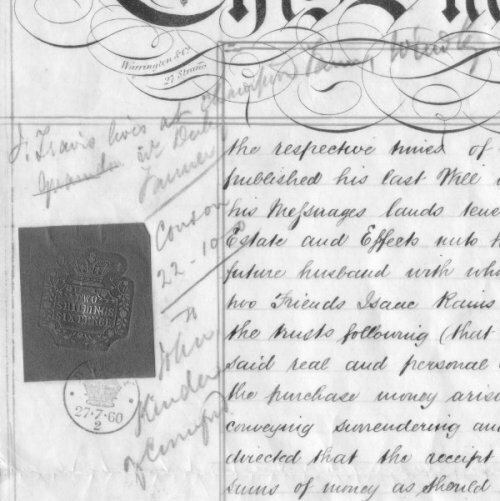 To complete my Rains connection Samuel Rains and Mary Wood had a son called Samuel who married Elizabeth Hardy of Winster. He moved from Ivonbrook to Winster, where they lived in Main st near the Winster Market house. Their son Frederick Rains moved to Manchester where he met and married my great grandmother. There is also a story surrounding Elizabeth Hardy and Samuel Rains. Family legend has it that Elizabeth was somehow related to Rear Admiral Sir Thomas Masterman Hardy (Nelson's Hardy) although we have never been able to work out the connection. She appears to have come from a long line of Hardy's from Youlgreave, but apparently the Admiralty wrote to Samuel offering him some money from the estate of Thomas. As Thomas died several years before Samuel and Elizabeth were born, we can only guess that it was something that arose once the daughters and/or widow of Thomas died many years later. Thomas had no male children that we know of, so presumably any relationship must have been more distant. Please feel free to use any or all of the above on your website. I will attempt to put together a fuller account of the Rains of Ivonbrook sometime this year and will send it to you. Meanwhile, if you have any questions, please feel free to ask. Please don't put this email address on your website (although you are welcome to use it to correspond with me). I have another akreibich@gmail.com which you are welcome to put on your website if you like, I'd be happy to hear from anyone with Rains connections or any information about Ivonbrook. P.S. Would it be possible for you to sent me a scan of the original document if that isn't too much trouble? I've had a look at the conveyance thank you. Have been able to fill in a couple of full death dates I didn't have and everything else seems to tally with the pedigree I have on the RAINS except for Benjamin BUXTON - I haven't a clue (as yet) where he fits into it, if indeed he does. The RAINS friends who were the original heirs/executors of John's will turn out to be his nephews, the sons of his brother Isaac. I'm presuming the John RAINS who ended up being one of the trustees was his son but could have been any number of his nephews who were all named John! It is rather strange that John left everything (after his wife died) to his nephews and not any of his own three sons & two (maybe 3) daughters who were still living. I suppose this conveyance could have just been concerned with only the barn and that his will probably mentioned all of his children - I wonder if his will has survived. I'll let you know if I find anything on Benjamin Buxton. I've got a photocopy of the Bonsall Tithe Schedule (1846) and copies of the Bonsall Tithe map (1847). If you will have patience for a week or two I can give you the exact location of the field, barn and number, who owned what, size of field, who rented etc. As far as I am aware there is a Sammy Rains still living at a farm on Bonsall Moor, he's quite elderly now and retired. I can't remember the name of his farm (that is why I need to look at my 6" O.S. map) but it lies north of the lane that runs across Bonsall Moor to Winster and I think is within Winster parish. Incidently I've found my gran's copy of "Adam Bede", if ever you're over in Hampshire and want to borrow it I will be more than pleased to lend it to you. Also any of my other records i.e. the complete set of Peak District Mines Historcial Society's journal, nearly a complete set of DFHS journals, quite a few DAS journals and Derbyshire Miscellany magazines, etc. Will be in contact soon. Strange the mail should bounce as I haven't changed my email address. However, I am currently having problems with getting mail for some reason so will look into that thanks. I don't suppose you still have a copy of the bounce message do you? How interesting that you picked that conveyance document up on eBay. I shall have a good look at it tomorrow and see if there is anything else in it that I didn't already know pertaining to the pedigrees of those involved. You might also like to contact Andrew Kreibich - (akreibich@gmail.com) - he is VERY interested in the RAINS of Ironbrook etc and has done very comprehensive research on them. I think he would be delighted to hear about this too. I'm still here John, will contact you off list. Strange the mail should bounce, it's still the same address as it has been for 25 years :). I forgot to tell you-the Brittlebanks of Oddo Hall were a prominent winster family, and on May 21 1821 william B murdered Dr William Cuddie and did a Lord Lucan (allegedly)! John, In the domesday book winster was Winsterne(I make that win's-or ewan's- stoney ground) and Ivonbrook was Winsbroc or wins brook,Ekwall in the Oxford dictionary of English place names has obviously missed the geographical connection.Saxon settlement would have been at the junction with Bonsall Lane, which is very rocky around, due to the Bonsall fault and dolomitisation of surrounding rocky outcrops making them more resistant to weathering.The drier upland contrasts with the brook further towards grangemill and of course the massively important Shothouse Spring.The present location of Winster would have grown during more peaceful times (Tudor onwards) when a commanding position was less important. I know of no instance of ewan becming iron, but several of it becoming evan or ivon. There is an old street in Derby called Irongate and my guess the clerk who wrote the victorian records knew of it and made a cognitive error.Just my theory!regards, David. Thanks john, I see your point with the writing.Of course it is entirely feasible that a clerical error by someone miles from grangemill is responsible. I drew attention to the V because firstly i wanted the location to be correctly identified on map. and secondly I can't find any evidence of staining of the stream, although there was an interesting industrial hamlet at grangemill.I am impressed by your research.Could the whole matter have arisen because J.Palmer[RAINS?] Jr inherited as a minor following succession of deaths of John, Samuel and Elizabeth? The gravestones at Brassington are well worth a look.Regards, David. Ps it is IVonbrook.Latter, Wigleymeadow and Tophill clearly shown in vicinity of Grangemill, Ible Winster and Bonsall Leys, an area associated with pasture and lead mining for 2000years.The Rains family can be found in Wirksworth record and Brassington churchyard, and in todays phone book at Top Hill. Why not visit the Barley Mow (closed mondays), walk over Bonsall Leys to Ivonbrook (preferably on one of Alan's guided walks) and stay at bonsall's favourite bb at the top of' town (details from alan) David. My mate Jeff Punchard (co Barley Mow, The Dale Bonsall) lived at Bonsall Leys, and Alan Webster, landlord of said pub (Google Mow and Hen to hit BM's website) takes walkers there regularly.David. John,with all the work you have done on Wirksworth I thought you lived there! Bonsall website is well worth a visit.They are very proud of their heritage. Do you want a map ref for Wigley Meadow or have you found it? The 1;2500 white peak shows it.A transcription might not be too much use if Ivonbrook for example is read as Ivorbrooke!, butI didn't want you to go to too much trouble-your project just excited my interest.We used to live at Bonsall lodge at the foot of Clatterway and I went to Bonsall Cof E and Anthony Gell's, and used to explore caves mines and quarries as a lad.I now holiday there whenever I can.David. Correction, Rains are in phone book at TOP HILL farm, Ivonbrook Grange, nr Winster/adjacent to Wigley Meadow. I wouldn,t mind a good copy of indenture to enable me to transcribe in light of my local Knowledge.The site of Shothouse spring appears to have been manicured by the national park, but its ownership and communal use as agricultural and domestic water supply has always fascinated me. Although the last property on Bonsall Moor was piped-up a decade ago, farmers still fill bowsers in the constant spring, and i always take some home in bottles.Have you a connection with Bonsall Historical society? David. The Rains family are still in the phone book at Ivonbrook/wigley Meadow. I am not sure if they are still at Top hill.In 1861 census (wirksworth Parish Records) the families are at both, but the householder at WM , John was only 20. (if I remember correctly 1846 list of tradesfolk shows samuel as farmer at WM).There are some interesting memorials in Brassington graveyard to Rains, where I believe John (of WM) was born. This is from memory of previous reading, not from the family direct, so I suggest you use it as a basis only for research in conjunction with Wirksworth PRs. Wigley Meadow is just up the road from the Hollybush, before Shot House Spring.Haven't you a photo of Hollybush with people? Compiled, formatted, hyperlinked, encoded, and copyright © 2007, All Rights Reserved.